Following the New 52 reboot, DC's first company-wide crossover was Forever Evil, which saw the evil superhumans of Earth-3 evacuate their doomed reality and take over the main DCU. From their world to ours, come the sinister Crime Syndicate. Johnny Quick & Atomica wreak havoc and no one can stand in their way... not even the Flash! The new costume is clearly inspired by the stupid original - it's red, with yellow boots and gloves, and two lightning bolts running from his waist up over his shoulders. But just because it's inspired by the old suit, it can still be as different from that one as Christian Bale's Bat-suit is from Adam West's. The lightning bolts are now the edges of a jacket, and there are ribbed panels wrapped around his shoulders. Those end at lightning bolts on his biceps, but he's also wearing gloves with a lightning motif that come up nearly to his elbows. There are things on the front of his boots that are probably supposed to be even more lightning bolts, but because they're right there on the front of his shins, they look more like red Christmas trees. And then there's the head. The Crime Syndicate's Johnny Quick seems forever cursed to wear the most terrible-looking headgear imaginable. This one retains the silly bullet-shaped dome of the original, but at least has the good sense to put some goggles over his eyes. The lightning bolts on his mask are part of the eyewear, rather than just sticking out of his ears. DC can't decide whether his helmet thing is supposed to be silver or red, but the toy went with the latter. Surprisingly, Johnny Quick has really good articulation. He has swivel/hinge ankles, double-hinged knees, swivel thighs, balljointed hips, a swivel waist, hinged torso, swivel/hinge wrists, hinged elbows, swivel biceps, swivel/hinge shoulders, and a balljointed head. Did you notice what's missing from that list? Nothing. Nothing is missing from that list. 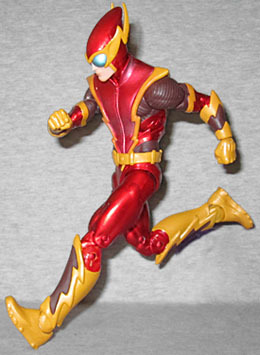 Johnny Quick moves the way an action figure made after 2004 should move. A few of the joints were stuck when I opened the figure, but some work freed them all up with nothing breaking. Success! Johnny comes with a pack-in figure, a 2" tall version of Atomica. She was the Crime Syndicate's advance scout, infiltrating the Justice League and betraying them from within. Her real name is Rhonda Pineda, and she was with her boyfriend on the rooftop when the lightning hit (she got knocked through a skylight and fell into Ray Palmer's lab). Atomica is unarticulated, but is sculpted in a feminine pose. Her costume is basically Ray Palmer's, but it leaves the hair exposed, and she's got a pair of goggles dropped down around her neck. The figure is mounted on a ⅛" thick clear disc base so she can stand up (even if her right leg got a little warped in the tray). 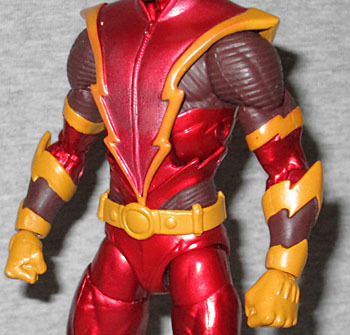 Johnny Quick's design is very busy, but it's still the best he's ever had - even with that doofy helmet. He moves like you want a quality action figure to move, and the inclusion of Atomica is icing on the cake. This is surprisingly good!